The votes are all in and counted and I believe South Africa is now a lot closer to becoming a REAL modern democracy. As you can see, the ANC has not obtained the two-thirds majority, to give it overall control of parliament and law making, for the first time since the end of apartheid. This means South Africa is starting to shape up like all the major modern democracies in the world in that it's starting to move in the direction of having 2 or 3 (4 in SA's case) major political parties running the country, without any one being in complete control. 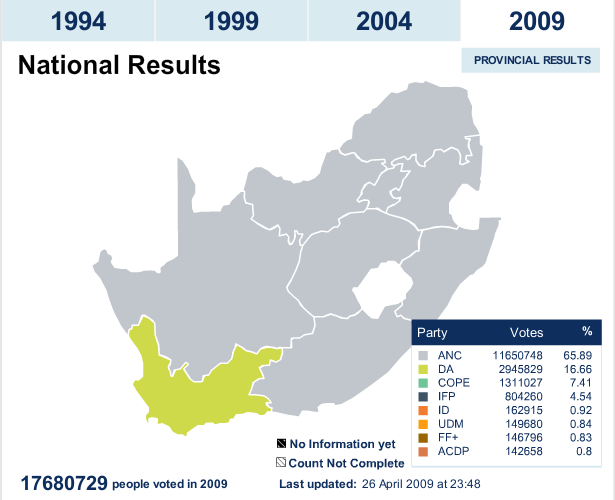 I'm not saying South Africa hasn't been a democracy since 1994 - not by a long shot, but now it's got some real competition in parliament and the other parties now have a lot more say in how the country as a whole is run. If ever there's a time to tell people their vote counts, this is it. It's going to be a very interesting 5 years between now and the next general election. Jacob Zuma has a lot to prove and will have a lot of work on his hands if he's going to live up to his election promises. The old apartheid demon will also have less influence in the next general elections as those elections will include first time voters who've never lived a day in their lives under apartheid. It'll all be history to them. South Africa is in for some interesting times, lets hope they're all good times.